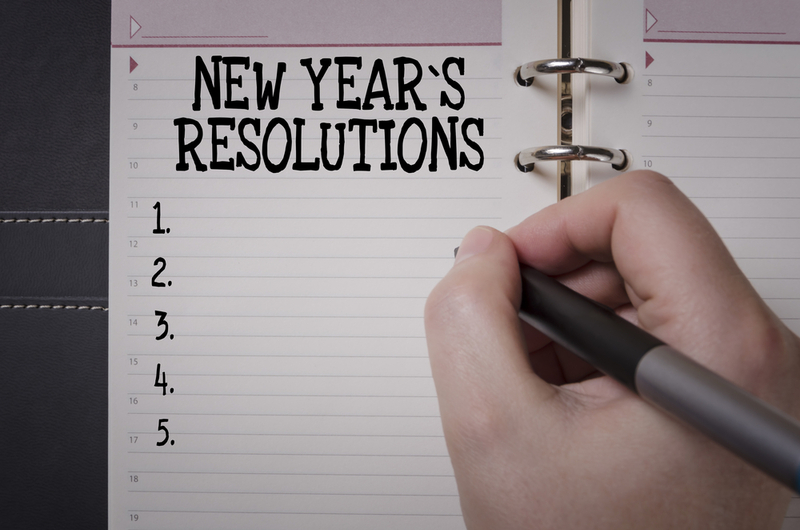 If year-after-year you find yourself making the same boring and unattained New Year’s Resolutions, we offer you some new goals you can try for 2018. 1. Write a business plan. If you’ve been thinking about turning that hobby into a business for years, or have a dream that has never quite gotten off the ground, try writing your ideas into a business plan format. You may be surprised and energized! 2. Schedule all your medical checkups. If you always put off doctor visits, try scheduling your yearly physical and your two dentist visits at the beginning of the year. Your health is irreplaceable—make it a priority this year. 3. Play more. What do you enjoy? Whether it’s walking in the park, dancing barefoot, playing silly card games or baking cookies, make it a goal to have more fun. 4. Read more books. Get your books for free from the library, listen in the car, or trade in books you no longer want for some new material at a second-hand book seller. You could re-read the classics, brush up on fine literature, or binge on spy novels or science fiction. Whatever tickles your fancy, just read it. 5. Sell stuff. If you have items in your home that are taking up space, consider selling them or donating them to a charity as a tax write-off. You’ll feel better without the clutter. 6. Keep a journal. Even if you’re “not a writer” you can benefit from keeping notes to yourself on a daily, weekly or monthly basis—perhaps even as a way to hold yourself accountable. If you date each entry, you’ll have a written timeline you can refer to when creating next year’s resolutions. If you consider yourself creative, a journal is imperative to explore your most profound ideas. 7. Be more grateful. You can become happier by simply counting your current blessings. Making a time to think through all the good things in your life, either upon rising or before going to sleep, can make a huge difference in the quality of your life. Schedule it in and make it a priority for yourself in 2018. 8. Do it now. Make it a goal to stop procrastinating. If you see the trash is full, take it out right away. Papers piling up? Remove the clutter. Little things add up to big things, and eliminating the “I’ll do it tomorrow” syndrome will bring emotional benefits along with an improved life. 9. Eat less. If dieting just isn’t for you but you’d like to lose a little weight, find an easy way to eat less calories next year. This can mean anything from only eating half of your dessert every day to splitting your entrée in half and eating the leftovers for lunch. Don’t diet, just eat a bit less of what you always eat. 10. Eat healthier. If the goal of “losing weight” is a losing proposition (because that one has been on your resolution list for years! ), decide instead to replace a few meals with something healthier. For instance, have a salad night once per week which includes all your favorite vegetable toppings. Or commit to purchasing and eating seasonal local fruit every month (apples in fall, strawberries in spring, cantaloupe in summer, etc.) Forget losing, just get healthier. 11. Learn something new. Whether it’s learning how to play the piano, learning another language or watching a documentary about your favorite historical figure, put aside some time to learn something new this year. 12. Say “no” more. Let’s face it, we’re all busy. If there are things on your schedule that don’t edify you in any way, consider saying no to the next invitation. If that committee never really gets anything done or your friends just want to sit around and complain, give yourself permission to say “no” and do something else with your time. 13. Spend a half hour a day on something. Have you always wanted to learn to play the guitar, but it seems too overwhelming? Make it easier by breaking it up into shorter time commitments. Even if you do nothing more than play the same chord for 30 minutes a day for a month, your finger calluses will get thicker, and you will soon find it easier and more desirable to leap on to the next level. You may find yourself accidentally going over the time allotment! 14. Move more. Even if you hate to exercise, find something that you do enjoy. You could take up salsa dancing, or just dance around the living room. Or create a family game by having everyone do 10 jumping jacks each time there’s a commercial on TV. 15. Enjoy the little things. Go to the ocean and build a sandcastle. Go to a pet rescue center and lavish love on all the kittens and dogs. Walk in the rain. Plant some seeds. You don’t have to have big goals this year—little ones will do. 16. Spend time in nature. Spending time in a wilderness area or nature reserve has been proven to boost your immune system, and can even make you more creative and more content. Whether it’s camping for a weekend, or going outside the city lights to gaze at the stars one evening, make it a point to spend time in nature. 17. Strengthen an important relationship. Is that special someone in your life feeling special enough? Make it a point to have regular time to talk (with no distractions), and make the time to do things you both enjoy together. Don’t wait another year to say “I love you” more often. 18. Meet with your financial advisor regularly. We can help you review your overall financial plan and make sure it’s on track to meet your goals, as well as review all of your accounts and make sure that your loved ones are all properly included as your family changes through the years. Why is this important? Because your beneficiary designations actually take precedence over your will! Contact Alpha Beta Gamma Wealth Management in Palm Beach Gardens, Florida at (866) 837-0999. We look forward to working with you in 2018!